pdfaPilot SDK is a software development kit that allows for integration of the pdfaPilot functionality in the closest possible way inside your own application. Because pdfaPilot SDK doesn’t rely on command-line or hot folder integration, it provides seamless development integration with the highest level of control for the parent application. pdfaPilot SDK provides a native C library that provides easy integration in C code or – through included header files – in C++ projects. Additional wrappers cater for .NET or Java environments. pdfaPilot SDK is available for Mac OS X, Windows, Linux, Sun Solaris and IBM AIX making it an extremely flexible way to integrate the pdfaPilot functionality. pdfaPilot SDK comes with developer documentation but also with a number of extensive samples to show off the broad feature set of the SDK and to get you started in your development project. These samples are of course not production code, but they provide a jump-start for your developers that will facilitate quick integration of the SDK. Building on pdfaPilot SDK gives you immediate access to all of the PDF/A capabilities of pdfaPilot, embedded in your application. callas software keeps close tabs on existing and emerging PDF/A developments and makes sure your applications remain up-to-date. This allows you to concentrate on your own strengths while using a reliably, easily customizable library to take care of your PDF/A requirements. The speed, quality and reliability of the pdfaPilot engine are undisputed; more than 60 OEM customers use the SDK worldwide; amongst those many well-known names such as Adobe, Foxit, Mitsubishi, Quark, Xerox. The list is a testament to the quality of pdfaPilot SDK and to the professional way in which callas software supports its customers. pdfaPilot SDK provides a complete set of callback functions to let you control PDF processing as it takes place. This provides a closer integration than possible with pdfaPilot CLI which relies on return codes and information through stdout and XML reports. Both solutions fully support parallel processing: pdfaPilot CLI through parallel processes (organized by the operating system) and pdfaPilot SDK through parallel threads (through the use of a special extension package bundled with every library). Variables to customize quality control and PDF fixing are supported by pdfaPilot CLI and pdfaPilot SDK alike. Additionally pdfaPilot SDK has possibilities to manipulate preflight profiles (allowing to duplicate, merge or modify preflight profiles in code). If your application already integrates with the Adobe PDF Library, pdfaPilot SDK offers the additional benefit of allowing you to open PDF documents with the Adobe PDF Library and then manipulating them with pdfaPilot SDK. This sort of cooperation is not possible with pdfaPilot CLI. pdfaPilot is used by many OEM customers worldwide integrated into their own products, mainly for document and email archiving based on the PDF/A standard, and for analysis, processing and conversion of office and print PDFs. Our OEM customers’ products are used in government agencies, finance or in the industry for archiving, document management, email management, product live cycle management and much more. For more information, click here. If you are interested in pdfaPilot SDK, let us know and we'll make you a quote. Recommended are at least 2 GB of free storage. 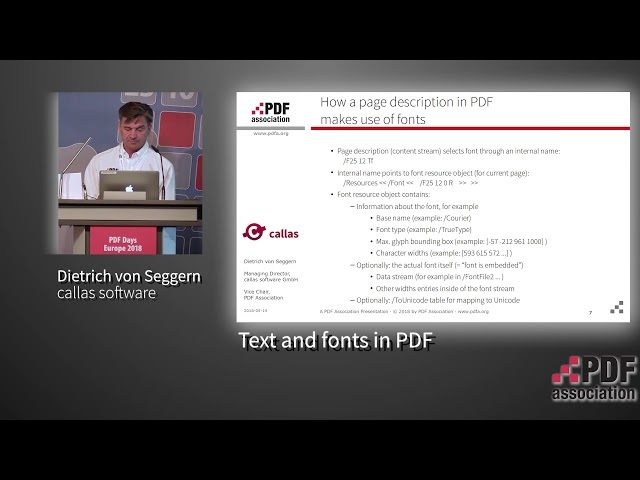 This session delivers an overview about PDF/X, PDF/A, PDF/E, PDF/VT and PDF/UA. Their specific use cases are explained and how related requirements are transferred into provisions of the respective standards. The development of the standards also show how the general use of PDF has been changed over time starting with PDF/X where PDF is an intermediate product for printed paper to PDF/UA where PDF is much more than what could be printed. David van Driessche, CTO of Four Pees, held an English webinar to introduce you to the different PDF related standards and how they are implemented and can be used in pdfToolbox. What profiles should I use? What's with all the version numbers? Checking versus fixing - what to do when? Question: During installation, I got a warning that the developer cannot be confirmed? Answer: callas software is a registered developer at Apple for MacOS. Due to some quite strict security settings starting with MacOS 10.7 only software downloaded from the Mac App Store can be installed directly. Just change the system settings in “Security and Privacy” to “Mac App Store and identified developers” before installing a callas software product. You can set it back to “Mac App Store” after the installation of course. The General License and Support Conditions valid from April 27th, 2015 onward, are provided via this link. The General License and Support Conditions are also available as a PDF document – please click here to download: General License and Support Conditions (April 2015). Question: What is the target user group of the callas software pdfToolbox products? Answer: pdfToolbox Desktop is targeted towards people who want to manually inspect or correct PDF files. It can be used either as a plug-in for Adobe Acrobat or as a standalone application (without requiring any Adobe software to be installed). pdfToolbox Server is oriented towards environments where fully unattended inspection and fixing is required. It can be configured with hot folders (also called watched folders) or can be integrated more closely into a solution using the available command-line interface. Question: I am using pdfToolbox Desktop or Server 6.0 or older. Can I get the latest version? Answer: Yes you can. Whether this will be with or without cost depends mainly on whether you have an active maintenance agreement for your software. Please contact your reseller or send an email to orders@callassoftware.com to inquire about more details. Question: Do I need Adobe Acrobat Standard or Professional to process PDF files with the callas software tools? Answer: No. You can use pdfToolbox Desktop as a plug-in for Adobe Acrobat is you choose to do so, but it can also be used as a completely independent application. The automated solutions (pdfToolbox Server / CLI) are always completely independent. Question: Are the demo versions identical to the full versions? Answer: Yes, the demo versions are fully-functional. However, they have a restricted lifetime. You can test our software for 15 days without restriction or obligation. Question: Where can I buy your products? Answer: callassoftware has an extensive list of partners that can provide local support and help with training / installation when required. You can find the full list of partners here. Alternatively the interactive products can be bought from the callas web shop here. Question: Who do I contact if I have general questions on a product? Answer: Your first point of contact should always be the local reseller; they are able to provide you with local support in your own language. Alternatively, send an email to us directly and we will be happy to help. Use info@callassoftware.com for general questions and support@callassoftware.com for technical inquiries. Question: I’m experiencing problems when installing or uninstalling software. Where can I get help? Question: How can I update my callas software product? Answer: It’s really easy to update a callas software product – you simply install the new version on top of the old version. As always it's safest to make sure you have a backup before you install new software on a production machine; specifically of the preferences folder where all of your custom profiles are stored. Question: How do I find out when the new version of my software is available? Answer: Customers who have a software maintenance agreement (SMA) automatically receive a notification informing them of all version changes for callas software. They can also access detailed information on the changes made in the special SMA area of the callas software web site. Alternatively check our download page; this always lists the latests versions of all products. Question: I urgently need a particular additional function for a callas software product. What can I do? Answer: At callas software, we are constantly striving to improve our products. Past experience has shown us that it pays to collaborate with customers on solutions and enhancements to the CLI versions. These functions can be tested on site in real production environments and then integrated into the standard version later on. If you have questions or suggestions, please send an e-mail to technology@callassoftware.com. Question: Where can I exchange information with other users? Answer: callas software has a forum where interested users can exchange information about their experiences and specific usage conditions and discuss the integration of callas software into their existing workflows. Click here to visit the forum. You might also like to visit the Swiss-based site www.hilfdirselbst.ch (German only). It contains prepress forums on the professional use of software for prepress processes, color management, and further processing. Many valuable posts about using our tools in your daily work can be found here. Question: Is it possible to exchange profiles between different program versions? Question: In which ISO format is print data best archived? Answer: As PDF/A is rather emphatic and distinctive about assuring long-term reproducibility or reutilization of PDFs, the print data that is sent to the printers as PDF/X must best be created as PDF/A too, so that archiving is possible immediately without additional processing. Question: I already have printable PDF/X files. Will I face problems when converting to PDF/A? Answer: No, conversion takes place mostly without problem – basically, every PDF/X-1a or PDF/X-3 file must also be saved simultaneously as PDF/A-1b. Question: What are the differences between PDF/A and PDF/X? Answer: The two standards PDF/X and PDF/A were developed by ISO to be largely compatible with each other – i.e. a PDF file can be simultaneously compliant with PDF/A and PDF/X. The ISO standards PDF/A (ISO 19005) and PDF/X (ISO 15930) were developed for different purposes. However, many of the requirements of the two standards are exactly the same. The sections below explain the main differences between PDF/A and PDF/X. PDF/A does not require – but does not forbid – the following technical print-related aspects that are required by PDF/X or are at least more common in PDF/X. If certain metadata is contained in the document information, that metadata must also be contained in the XMP metadata in its equivalent form. PDF/X requires the general embedding of fonts, even for invisible text. PDF/A does not require fonts that are used only for invisible text to be embedded. Invisible text is often used for scanned pages to give a scanned page image text that can be used for OCR text recognition. Important: There are separate output intents for PDF/X and PDF/A! An output intent specifies the output purpose for a PDF file. Examples: A specific printing process such as sheet-fed offset on coated paper, printing on a specific type of digital printer, or output on the screen. PDF/X always requires an output intent. For PDF/X, the output intent must refer to the intended printing method. An output intent for the screen – for example, via sRGB, is not allowed. With PDF/A, if there are two (or more) output intents, their target profiles must be identical. In most cases, the use of suitable tools such as pdfaPilot or Preflight in Acrobat Professional 8 should make it possible to save a PDF/X file as a PDF/A file without problems occurring. In particular, problems can occur when attempting to store PDF/A documents that were not initially created for production printing as PDF/X files. Question: Can a PDF/A file be simultaneously compliant with PDF/X and vice-versa? Answer: Yes, both PDF/X and PDF/A have been intentionally developed by ISO in such a way that a PDF document can conform to both standards at the same time. Thus, although typographical aspects – e.g. information on trappings – are not explicitly demanded by the PDF/A standard, they are not forbidden either. PDF/A also doesn’t forbid creation of PDFs so that they will be considered as production-compatible in the graphics industry. In detail, divergences between PDF/A and PDF/X have indeed resulted from the development chronology of standards. In practice, these minor differences seldom pose a problem and conversions ought to be smooth. Question: How do you generate a simultaneous PDF/A & PDF/X compliant file? Answer: With the Preflight functions developed by callas software, like in Adobe Acrobat 8 Professional, a simultaneous PDF/X and PDF/A compliant document can be created from a PDF in a single step – simply set up a Preflight profile where both standards can be activated in the “Convert to PDF/X or PDF/A” menu. You can try out the whole thing using Acrobat Professional 8 – the Preflight functions available there offer various options, e.g. save a PDF/A as PDF/X; or save a PDF as PDF/A and as PDF/X in one go. With the correction options available in Preflight you can also sort out some problems through appropriate correction. On the contrary, Adobe Acrobat Professional 7 offers PDF/A support only to some extent, as the PDF/A standard was not yet fully ready during the development of Acrobat 7. If automatable solutions are demanded, the pdfInspektor CLI and pdfaPilot CLI from callas software can help: Both command-line modules are based exactly on the same source code as the Preflight function in Acrobat, however run unmanned in Server mode, alternately on Windows, Mac OS X, Linux or Sun. They can be integrated in Helios or Switch environments without any problem. Upgrade to pdfaPilot Server 5 or pdfaPilot CLI 5 requires SMA for at least one additional year. Please contact your reseller for further information. Upgrade of pdfaPilot Server 5 or pdfaPilot CLI 5 free of charge for owners of a Software Maintenance Agreement (SMA) for pdfaPilot Server 2, 3 or 4 or pdfaPilot CLI 2, 3 or 4. Update free of charge for owners of a pdfaPilot licence.